Photograph taken at Mesquite Wash, eastern Maricopa Co., Arizona, Oct 26, 2002. Bosque is a Spanish word for woodland and is used in the Desert Southwest to describe an often closed-canopy woodland that develops adjacent to desert streams and rivers. It is one type of riparian habitat where the desert gives way to an oasislike verdance. The most frequent trees are mesquites, especially Velvet Mesquite, Prosopis vellutina. These are mostly low trees rarely exceeding 15 meters and because there is rarely more than one canopy layer, the understory gets plenty of light. After periods of rain or during the winter months when the deciduous trees are leafless, a variety of lower shrubs and herbs can be found. The mesquite bosque is a highly productive habitat in terms of mammals, birds, insects and reptiles that make use of the shade and food resources. 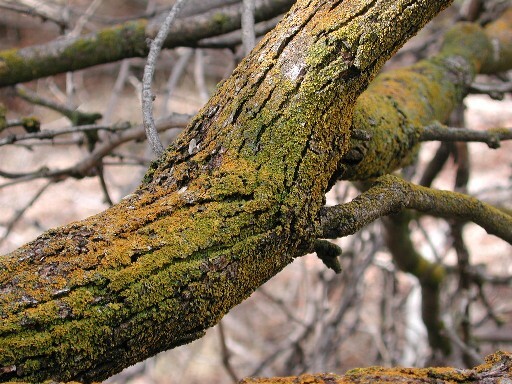 With higher humidity and shade lichens flourish on tree branches. Other trees and shrubs common here include desert hackberry, graythorn, blue palo verde, mexican elder, virgin's bower, and indian root.